The parish of St Thomas' was served from St Mary’s Cresswell from 1889 when the old non- conformist chapel began to be used by the catholic parishioners of Tean as an all-age school and a weekend church. Before that, Catholics would walk the three miles, over the fields to St.Mary's Cresswell. On the retirement of Fr Patrick Meagher in 2001 the parish began to be served from St.Giles. 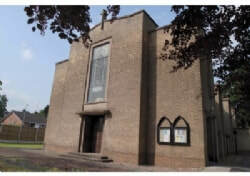 The present church was built in 1938 in the " Art Deco" period of pre- war Britain. The architect was E Bower Norris, of Manchester-based Hill, Sandy & Norris (previously Sandy & Norris of Stafford). The builders were the locally based Beddoes & O’Dair of Tean. The pews were brought to St Thomas’s from St Wilfrid’s, Cotton, which in turn had acquired them from Cotton College. The church also has obtained a two metre-high Crucifix from Cotton which has recently been restored and installed on the end wall of the sanctuary. The Lady Chapel has an Art Deco-style stone altar and a mosaic and opus sectile reredos.